These Work Gloves are mechanics gloves, which are strong enough to withstand repeated use while still enabling dexterity. They're size L and have an added grip. 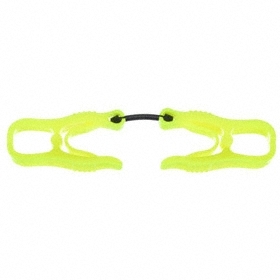 They have a hook & loop cuff style, which has a hook-and-loop band at the wrist to adjust the fit of the glove. They also have the following palm materials: Silicone and Synthetic Leather. They have Nylon on the back of the hand and are black in color. Includes 1 pair. 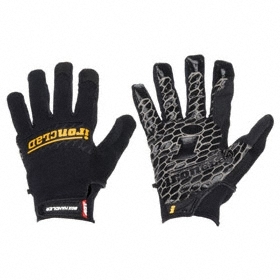 Wear these gloves to protect hands from dirt and scrapes, scratches, and other minor injuries when handling tools or abrasive materials in everyday work applications. These mechanics gloves provide good dexterity and a snug fit that reduces hand fatigue and helps prevent the glove from catching or snagging on objects. Wear them to protect your hands from dirt and abrasive materials in tasks such as construction, framing, and material handling applications.